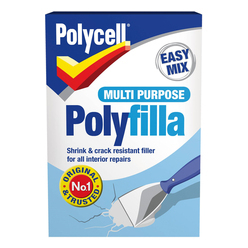 Multi-Purpose Polyfilla Powder polyfiller mixes to a smooth, creamy consistency. Special binders give guaranteed adhesion and a fill which will not shrink or crack. It is the ideal versatile filler suitable for a variety of jobs, even large areas. Guaranteed adhesion, will not shrink or crack. Available in original powder or ready mixed. ToolsFilling knife, mixing bowl and sand paper. mixing bowl and sand paper.